A flagrant foul is called when a player makes contact with an opponent that is deemed intentional, excessive, and unnecessary. 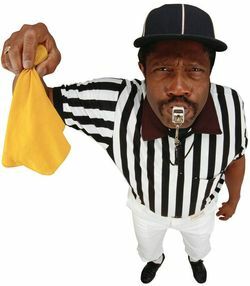 It is an unsportsmanlike act and the offending player is ejected immediately. While this is most commonly during the game and course of play, it can occur off of the court or field. The penalties vary to the degree of the foul. By now almost every person in America is aware of the NFL player, Ray Rice, who knocked his then fiance unconscious while arguing in an elevator. They were vacationing in Las Vegas. The first video showed him dragging her, unconscious, off of the elevator in February of this year. The most recent video last week shows the punch which knocked her out. Domestic violence in any form is unconscionable. It is intentional, excessive, and unnecessary. Domestic violence is at least a flagrant foul. Rising to the degree of injury, domestic violence is far worse. Friendly fire is an armed forces term for when one soldier shoots his or her fellow soldier in the course of battle. In the team context, I will equate domestic violence with friendly fire injury or death. Why so much worse? Because the harmed person is not an opponent. Ray Rice’s fiance – and any partner in a relationship – is supposed to be on the same team. They are fellow soldiers. Considering most professional sports teams’ take on domestic violence they are just as guilty of the flagrant foul because of their continued overlooking the incidents. This overlooking has a lot to do with the team wanting their players to keep the fight alive. No team can win if the players are not pumped and hyped with the killer instinct. There is much needed change in the domestic abuse situations we see too much of from professional athletes. The offending players need to keep their aggression on the field during the game. Ro>1 Wise is the man who is hard on himself and easy on others. Small-minded is the man who is easy on himself and hard on others. Personally dogmatic about my life and forward motion, without trying to impress on everyone else the same standard. I hope we will all get there, though. I find, in every day life situations and interactions, ways and means to challenge my own perspective and world view. The goal is continued personal growth while challenging those who are interested in my thoughts and findings.